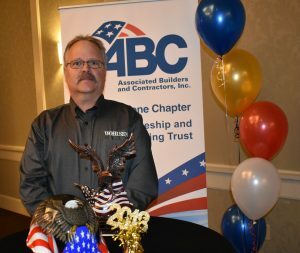 We are thrilled to announce Phil Garrett, one of Wohlsen Construction’s master carpenters, was named ABC Keystone’s Craft Professional of the Year for carpentry. This is the second year that ABC Keystone has conducted the competition, and it is the second year that a Wohlsen craftsperson was awarded. The winner is selected based on his or her mastery of skills, safety performance, job site performance, productivity, and leadership. Garrett was recognized for his work on Phase 2 of Masonic Village at Elizabethtown’s Grand Lodge Renovations, the Skilled Nursing Renovations at Messiah Lifeways, and the Sollenberger Sports Center at Messiah College. Garrett, who has worked as a carpenter with Wohlsen for 22 years, draws on his vast experience and knowledge to meet any challenge that may arise. His skill, passion, and work ethic make him an invaluable member of our team. Garrett represents the hard work and quality performance that is embodied by the entire Wohlsen team and that is exemplary of merit shop construction.